Applications for free and reduced price meals are available for download on this website. Please complete one application per family and return with your child to school or you may mail it to the Board of Education Office, 305 S. Washington Street, Castalia, Ohio 44824; attention Sarah Ransom, Food Service Director. Applications must be submitted every year to continue on the program. If the application is approved, your child(ren) will begin to receive or continue to receive free or reduced price meals from the date of approval. A letter will be sent home notifying you of your child's meal status. Applications can be submitted at any time during the school year if your family financial circumstances change. All information submitted to the school is kept confidential. There is no discrimination or identification of free or reduced price paying students. We urge all families to consider filling out an application. 2018-2019 Free and Reduced Lunch Applications can be filled out any time throughout the school year if your income or family size changes. The Food Service department provides both breakfast and lunch at Margaretta High School and Margaretta Elementary. Margaretta's Food Service Program provides wholesome, nutritious meals while keeping in mind students preferences. School lunch meets 1/3 of the Recommended Daily Allowances set byNational School Lunch Program. In January 2008 the Department of Safety, Health and Nutrition after completing an audit of Margaretta's Food Service Program commended the staff on the "great job of meeting recommended daily allowances for iron, calcium, vitamins A and C as well as meeting the target levels for saturated fat and total fat". An Honorable Mention Stellar award for best nutrition practices was awarded to Margaretta's Food Services department in October 2011 from the Ohio Department of Education. We continually introduce new items that students should find fun and nutritious. Whole grains along with fresh fruits and vegetables are among the many choices offered to students every day for breakfast and lunch. Our goal is to serve a wholesome, nutritious meal everyday to every student at a moderate cost and the smiles are free! Our schools have a computerized Meals Plus system. Each student has his or her own account regardless of free, reduced or paid status. The benefits of this system are students will not have to bring money to school everyday. You may pay by the week, month or longer if you prefer. This system provides a better method of protecting the confidentiality of free and reduced price students. This system also provides an excellent audit trail of all transactions. It also allows for faster and smoother serving lines enabling students to enjoy their lunch and free time with their friends. Meal pre-payments on student's accounts carry over year to year and school to school. Checks need to be made out to Margaretta Local Schools. Please write your child's name in the memo part of your check. Please send separate checks for each student unless they are in the same building. Please contact the school cashier or the food service office if you need specific information or have concerns about your child's account. Cafeteria policy for elementary school students limits students to three charged lunches. A letter is sent home after the first charged lunch or when the account is $1.00 negative. A second letter is sent home after the second charged lunch. A third letter is sent home after the third charged lunch. After three lunches are charged and their accounts have a negative balance, the students will not receive the published lunch. These students will receive a peanut butter sandwich and a carton of milk until their negative balance is paid in full. Students with an allergy to peanuts will receive a cheese sandwich. Students with any negative amount are not allowed to purchase a la carte items, including milk. To notify parents having a negative balance, the following procedure will be in effect immediately. A free and reduced lunch form will accompany notification of the third lunch charged. Parents will have five (5) days to satisfy the balance, return a completed free or reduced lunch form or make other arrangements with the building principal. If no attempt has been made to satisfy the account or provide for the child's lunch within five (5) days, the building principal will notify Children's Services. Students at Margaretta Middle School are not allowed to charge lunches. A student who does not have enough money on their account for lunch will be asked to call home to notify the parent(s).The child will be allowed to purchase lunch that day only. The next day, if money is not received on their account, they will be given a peanut butter sandwich and a carton of milk until their negative balance is paid in full. Students with any negative amount are not allowed to purchase a la carte items, including milk. Students at Margaretta High School are not allowed to charge lunches. A parent may call the school cafeteria or the Food Service Director to place a block on their child's account to prohibit the purchase of a la carte items. When a check is returned to the Treasurer's Office for NSF, the parent will be notified by phone call or email and the amount plus an NSF fee will be reversed from the student's lunch account. Payment for the NSF check must be in the form of cash, cashier's check, or money order. Payment must be received within ten (10) days of the notification. If payment is not received, it will be turned over to a collection service. Withdrawn Student - For any student who is withdrawn, a written request for a refund of any money remaining in their account must be submitted. An email request is also acceptable. All accounts must be settled at the end of a school year. Letters will be sent home approximately four to five days before the last day of school to for elementary students whose accounts are low. Balances over $1.00 may result in grade cards being held until the balance is paid in full. Balances may be checked or paid at any time at K12payment center. All refunds must be requested within one year. Unclaimed funds will then become the property of the Margaretta Local Schools cafeteria. Breakfast is offered to all students in Margaretta Local Schools. The cost of breakfast is $1.60. If you are a student that receives free or reduced priced lunches, those same benefits apply for breakfast. Reduced price breakfast is .30 and students eligible for free meals will receive both lunch and breakfast at no charge. Breakfast is served each morning in the school's cafeteria before classes begin. We participate in the Farm to School Program where farm-fresh foods are incorporated into ur schools' menus. Thank you to our local farmers who participate. 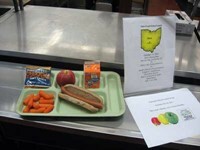 We also celebrate our state with an All Ohio Day menu where all foods offered that day for lunch are products of Ohio.